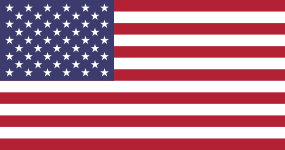 ↑ In the 9th edition of the Standard Color Card of America, "White", "Old Glory Red", and "Old Glory Blue" were, respectively, Cable No. 70001, Cable No. 70180, and Cable No. 70075. The Munsell renotation coordinates for these were taken directly from the Reimann et al. paper, the CIELAB D65 coordinates were found by converting the xyY values in that paper to be relative to CIE Illuminant D65 from Illuminant C using the CAT02 chromatic adaptation transform, and relative to a perfect diffuse reflector as white. The "relative" values in the table were found by taking Cable No. 70001’s luminosity to be that of the white point, and were converted to D65 or D50 also using the CAT02 transformation. The values for CMYK were found by converting from the CIELAB D50 values using the Adobe CMM and the GRACoL 2006 ICC profile in Adobe Photoshop. ↑ The Pantone color equivalents for Old Glory Blue and Red are listed on U.S. Flag Facts at the U.S. Embassy's London site. ↑ The RGB color values are taken from the Pantone Color Finder at Pantone.com. ↑ "Fringe on the American Flag". สืบค้นเมื่อ 2006-06-27. ↑ See McCann v. Greenway, 542 F. Supp. 647 (W.D. Mo. 1997), which discusses various court opinions denying any significance related to trim used on a flag. ↑ A 2002 BBC documentary featuring the town of Selby and Selby Abbey showed the coat of arms with the commentator referring to it as the inspiration for the U.S. Flag, a commonly held belief in Britain. ↑ Federal Citizen Information Center: The History of the Stars and Stripes. Accessed June 7, 2008. ↑ "United States Flag History". United States Embassy. สืบค้นเมื่อ 2009-02-03. หน้านี้แก้ไขล่าสุดเมื่อวันที่ 2 พฤศจิกายน 2561 เวลา 13:14 น.